Author: Stewart Taylor, Sarah Set In . . . Newcomer Sarah Stewart Taylor delivers a compelling and atmospheric cozy mystery that introduces Sweeney St. George, an art historian in Boston with a special interest in the art of death. 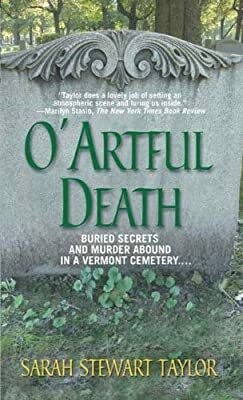 Sweeney becomes interested in Byzantium, Vermont, an art colony that flourished in the late nineteenth century, when she comes upon a photograph of the striking gravestone of a girl who drowned, and may have been murdered, in 1890. The stone is in a tiny cemetery surrounded by other beautiful, if unremarkable, headstones, some dating back hundreds of years. But the unsigned sculpture that marks this young woman's grave is of extremely high quality and the artist is unrecognizable. Sweeney is soon hooked, not only on the mystery of who created the beautiful sculpture but also on the details of the events surrounding the girl's death. When the friend who showed her the gravestone invites Sweeney to visit his relatives in Byzantium for Christmas, she jumps at the chance, knowing full well that the girl's murder has achieved the status of mythology in the town and hoping she'll be able to uncover new information. But by the time they arrive, her interest in the girl and the sculpture has gotten around town and, in fact, seems to have disturbed a killer. For not long after Sweeney arrives, one of the girl's descendants is murdered, shot and left lying in the cemetery. Taylor has written a remarkably accomplished debut mystery in the traditional cozy vein, and she's sure to win over legions of fans with O' Artful Death.